Ansonia Clock Co., Royal Bonn, "LaVergne", ca 1914. 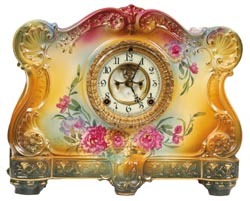 This is amuch bigger, more colorful clock than the catalogs reveal. It is 11.75" high, and 14.25" wide. Many colored case, beginning with red on top, quickly changing to light blue, light green, yellow, and back to light blue then greens at the base. A lot of gold is used around the edges and on the base, some flowers are all gold. Hopefully the picture will reveal the many pleasing colors. Ly-Ansonia No. 2613.